November 2018 – Colchester, VT: A frozen PRD failed after the vehicle was brought into a maintenance facility where the PRD thawed, resulting in a leak and subsequent fire when the leaking gas found an open ignition source in the heating system. 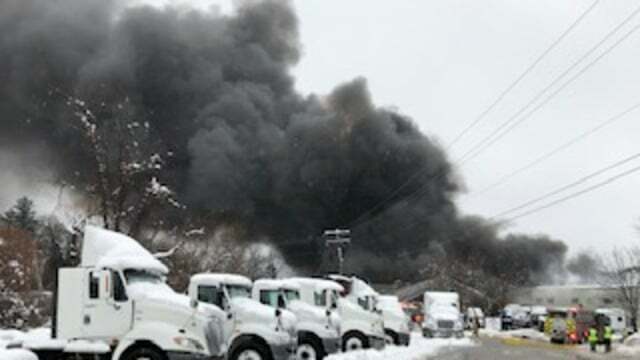 November 2018 – Colchester, VT: A frozen PRD on a truck in Vermont failed after the vehicle was brought into a maintenance facility where the PRD thawed, resulting in a leak and subsequent fire when the leaking gas found an open ignition source in the heating system. The facility burned down. There were no injuries. It is suspected that liquid may have seeped or accumulated into the vent line, allowing the PRD to fail and then vent gas when the PRD thawed inside the maintenance facility. It is also suspected that the maintenance facility had not been modified to accommodate natural gas vehicles. Vent caps are a small but important feature required to be installed on all CNG vehicle vent lines because they prevent water or other debris from collecting in the vent lines. As may have been the case in this incident, any liquid inside the vent line may freeze or otherwise cause the PRD to fail, creating a potentially unsafe condition. In addition, beginning in the 2016 version, NFPA 52 requires that vent lines resist the accumulation of water due to rain, vehicle washing or moisture due to condensation. This usually involves a small drain hole drilled into the vent line. For safety reasons, it is imperative that the presence of vent caps be verified during CNG fuel system inspections, and missing vent caps must be replaced as soon as they are noticed.